Open Shortest Path First (OSPF) si TCP/IP internet routing protocol that's classified as an Interior Gateway Protocol (IGP). OSPF protocol is based on link-state or SPF technology. This is a departure from the Bellman-Ford base used by traditional TCP/IP internet routing protocols. - RFC2328. Each router maintains a database describing the Autonomous System's topology when using a link-state routing protocol, . The database is referred as link-state database. Each router participate in link-state has an identical database that identify attached router interface and reachable neighbors, then it's distributed throughout the Autonomous System with flood them. When all routers using OSPF protocol, they will run the exact same algorithm, parallelly . Information that they get from link-state database, help them build short-path tree with itself as root. Then they calculate the route to each destination in the Autonomous System based short-path tree. based on short-path tree. For this posting I'll not explain about OSPF too much, because this post focusing to help you how to configure OSPF, For better knowing about OSPF, please refer to RFC site (ietef). Before We configure the router, We need some information like Interface IP, Loopback IP, Available port that want to use, additional information like hostname, OS version. This information is needed to make integration successfully and network engineer aware with their environment in live/production network. You get this information from your consulting engineer, or any person that have responsibility with IP Planning and Design. Below the Information about loopback IP address for each node and the hostname for the router. 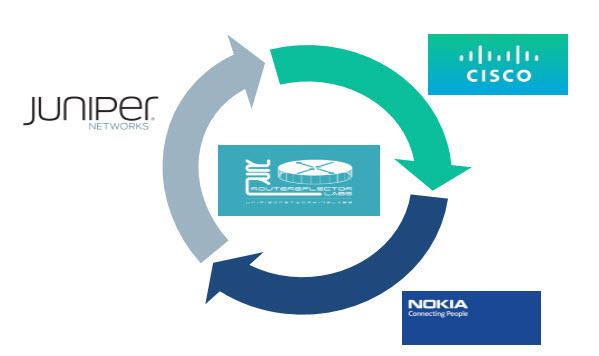 We use loopback ip for several reason, such as for tldp target IP, ibgp neighbor target IP, ldp transport that using system/loopback interface, and others. be sold, leased, loaned or licensed to any non-Alcatel entity. A:vRR# configure card 1 card-type "iom3-xp-b"
*A:vRR# configure card 1 mda 1 mda-type "m5-1gb-sfp-b"
Use the 'admin' mode 'configure' command to modify this configuration. A:LAB-PE-1-SR# configure router interface "system"
Nokia 7750 - SR has a port that not binding with interface. It different than other 2 routers, where the port bind to interface. So when you work with NOKIA IP Product you need configure the port first then configure the interface. *A:LAB-PE-1-SR>config>port# description "to_LAB-PE-2-MX - ge-0/0/0"
A:LAB-PE-1-SR>config>port# description "to_LAB-PE-3-CRS - Gi0/0/0/2"
root@LAB-PE-2-MX# set interfaces ge-0/0/0 description "to_LAB-PE-1-SR Port 1/1/1"
root@LAB-PE-2-MX# set interfaces ge-0/0/2 description "to_LAB-PE-3-CRS - Gi0/0/0/0"
RP/0/0/CPU0:LAB-PE-3-CRS(config-if)#description "to_LAB-PE-1-SR - Port 1/1/3"
description "to_LAB-PE-1-SR - Port 1/1/3"
When you done with interface configuration, then verify with ping test. After create OSPF configuration and commit, you should check, ospf interface, and make sure ospf neighbor is establish. 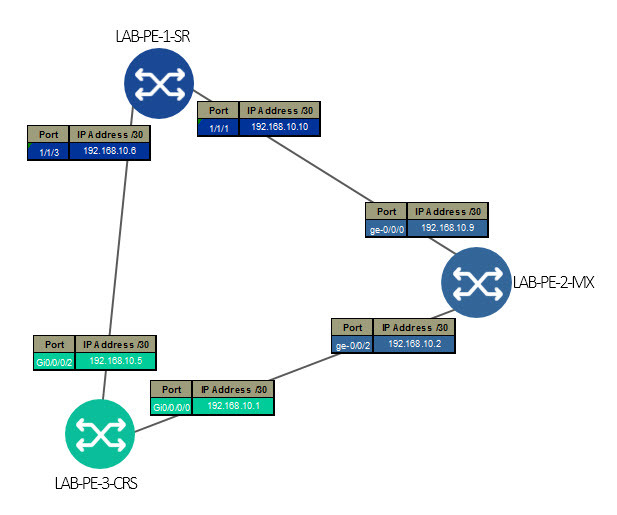 And Loopback interface in each node is reachable from others Node that connect using OSPF.